Dozens of rockets fired from Gaza landed in Israeli cities through the day Monday, causing fires and at least one casualty, according to the Israeli Defense Forces. Hamas has taken responsibility for the attacks, which constitute a war crime. Videos from the IDF showed the torrent of rockets above Israeli airspace. Iron Dome, part of Israel's surface-to-air response system, can be seen engaging the incoming barrage. Over one hundred rockets had been fired into Israel by Monday evening local time. Hamas announced it was launching the strikes in conjunction with Palestinian Islamic Jihad and other terror organizations. It was a response, the group said, to an Israeli intelligence mission carried out the night before, the New York Times reports. The escalation came hours after Palestinians and Israelis buried combatants who were killed on Sunday night, after what Israeli news media described as an Israeli intelligence mission inside the Gaza Strip that went awry. Six Hamas fighters, including a commander of forces in the Khan Younis area, and a member of the Popular Resistance Committees, another armed faction, were killed. An Israeli Druze lieutenant colonel in the elite Maglan unit, a commando brigade, was killed in the clash, and was hailed as a national hero at his funeral Monday. Hamas, the group that governs Gaza, said in a statement that it was collaborating on the strikes against Israel with rival factions including Palestinian Islamic Jihad, the Popular Resistance Committees and several other armed groups. The groups called the barrage "a measured and carefully thought response to last night’s incident," and warned Israel that "the range and intensity of fire from Gaza will increase in accordance with the volume of the Israeli response." Some rockets landed on their intended civilian targets. Photographs and videos shared on social media show a charred bus on a highway. Others showed a home in the Israeli city of Sderot engulfed in flames. Following the Palestinian escalation, Israeli Prime Minister Benjamin Netanyahu cut short his visit to Paris as part of the centennial of the First World War's end. The Israeli Air Force announced it had begun striking terror-related targets in Gaza in response. Government officials instructed those in the south of Israel to remain proximate to reinforced shelters in the event of incoming rockets. Citizen on the side of Israel furthest from the Gaza Strip, including the Dead Sea and the Judean Desert, received alerts of incoming rocket fire throughout the day. The Israeli Ministry of Foreign Affairs shared a screenshot of the alerts, accusing Hamas of "directly & intentionally" targeting civilians. Following Sunday's raid, thousands in Gaza called for revenge for the death of Nur Barakah, a mid-level Hamas commander. Hamas published an image lionizing those killed in the raid. The Israeli soldier killed Sunday, whose name remains undisclosed, was 41 and a father of two. Thousands of Israelis, including members of the Knesset and Netanyahu‘s cabinet, attended his funeral earlier today. The raid and subsequent rockets follow several months of saber-rattling but relative calm between the two parties. Just last week, Israel allowed Qatar to provide Gazans with $15 million of relief. Hamas, which rules the unstable coastal enclave, had quieted its protests in response. Reacting to the Qatari assistance just three days ago, Seth Frantzman argued in the Jerusalem Post that all sides were on edge, but no one was seeking conflict. "One false move," however, "and a major conflict could develop." 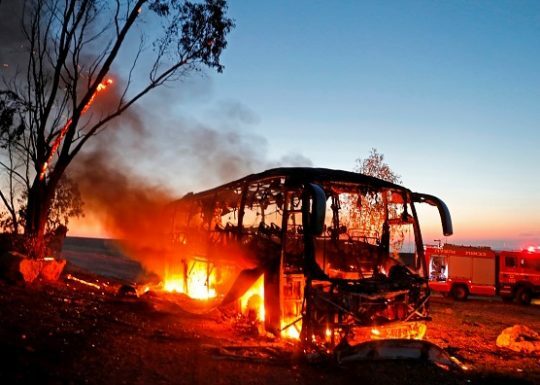 There have been periods this year during which Palestinian terrorists fired rockets, sometimes hundreds, into Israel without an Israeli military escalation. The IDF last mobilized and fought a full-blown war against Hamas in the summer of 2014 during Operation Protective Edge. This entry was posted in Issues, National Security and tagged Hamas, Israel, Terrorism. Bookmark the permalink.